Hatton History looks at a defining two decade period in the long 100+ year history of the Hatton Gallery and Newcastle University’s Fine Art Department (then King’s College, Durham University), through items held in the institutional archives and records. 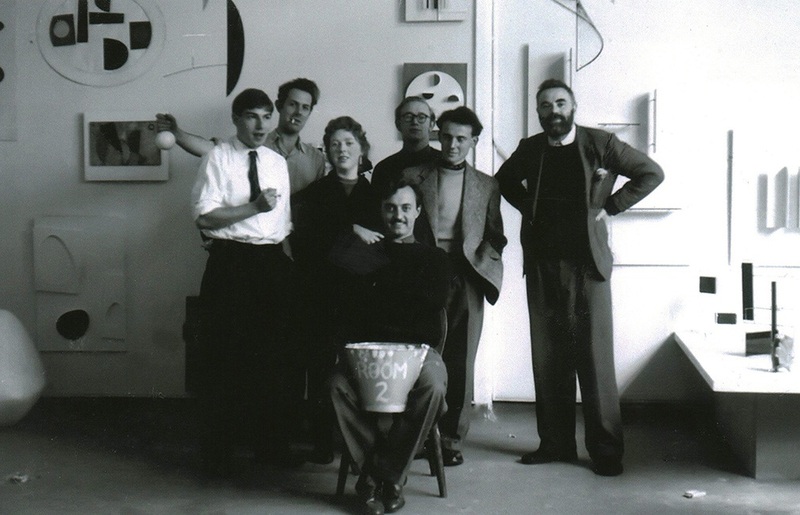 1948-68 saw dramatic shifts occur across all aspects of the Gallery and Department; changes in how the students on the Fine Art course were taught and by whom, the establishment of a permanent collection of art and the development of an important and sometimes radical exhibition programme. 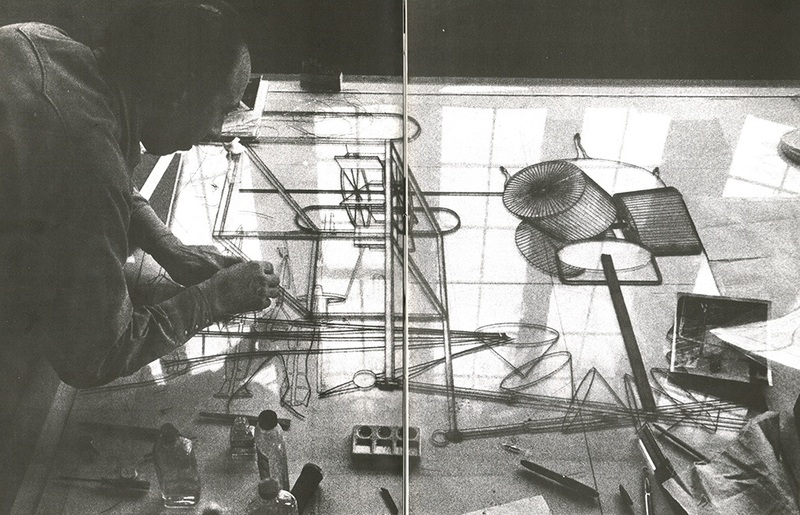 These changes were orchestrated by artists working in the Department, particularly the Professors Lawrence Gowing and Kenneth Rowntree and others such as Roger de Grey, Victor Pasmore, Richard Hamilton, Ian Stephenson, Eric Dobson, Derwent Wise, Rita Donagh and Matt Rugg. The roots of the Hatton Gallery and the Newcastle University Fine Art Department, both housed in the King Edward VII building opened in 1912, actually go right back to the 1830s. Professor Hatton was brought into the Department in 1890 and served until his death in 1926, when the already existing gallery was named after him. Hatton’s successors, Professors E.M.O’R. Dickey (1926-31) and Allan Douglass Mainds (1931-45) focussed primarily on the important development of the School, its teaching and staff, rather than the Gallery or the Collection. However, Robin Darwin’s brief tenure (1946-48) in the immediate post war period set a progressive tone, particularly bringing a new focus on to the exhibition programme, which his successor, Lawrence Gowing would continue through the 1950s. This long decade marks the tenure of Lawrence Gowing as Professor of Fine Art and the establishment of new and vigourous programmes of exhibitions, acquisitions and teaching. Pasmore and Hamilton worked to develop a new ‘Basic Course’ for first year students, aimed at encouraging them to experiment with the fundamental principles of line, shape, colour and form. Gowing focused on developing a permanent collection for the Department aimed at givng the students access to examples of European Art from the 14th-17th centuries, making full use of his art world connections to acquire some significant works. Vaughan experimented with a few different versions of this small sketch. For the catalogue accompanying the exhibition Vaughan experimented with a few different versions of this small sketch of an isolated cottage – the version used on the catalogue is slightly more ‘finished’. The Moore exhibition saw the official opening of the two new side galleries seen in these two installation shots. Note again the use of the Hamilton designed open framework plinths. 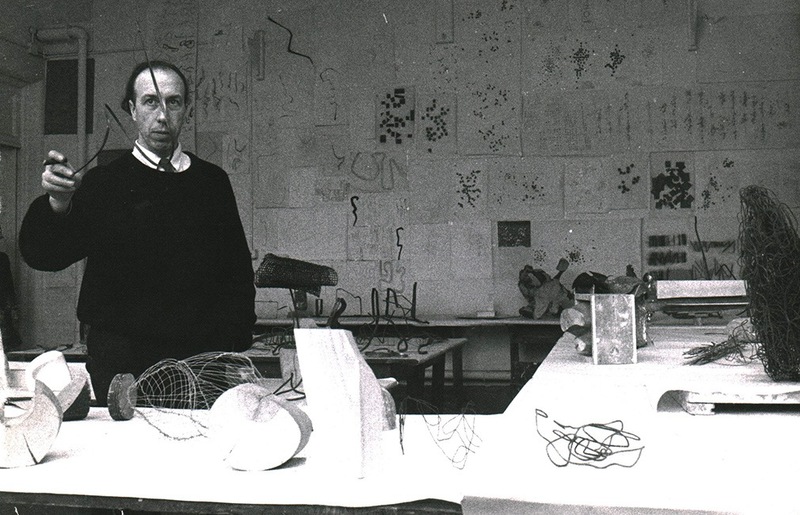 This photograph of Professor Lawrence Gowing taken in the studios in the Fine Art Department in 1957 appeared in the catalogue for his exhibition held in the Hatton Gallery in 1983. When in 1948 he was appointed as Professor of Fine Art at Kings College, he was only 30, four years later he was awarded a CBE and made a Trustee of the Tate Gallery. 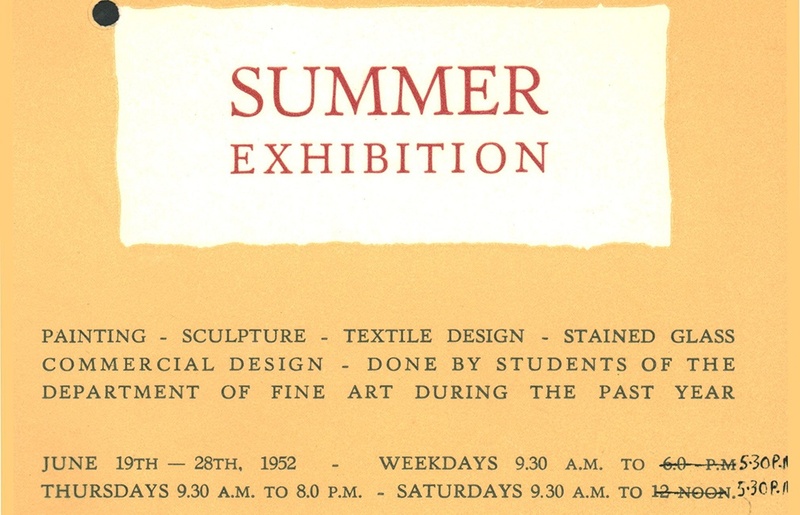 Cover of the 1956 student Summer Exhibition catalogue, designed by Rosemary Saunders using the then new and exciting medium of felt-tip pen. Oil on canvas, purchased from Appleby Brothers. Gowing selected this painting and three additional drawings to purchase from Rogers’ exhibition at the Hatton in 1955. 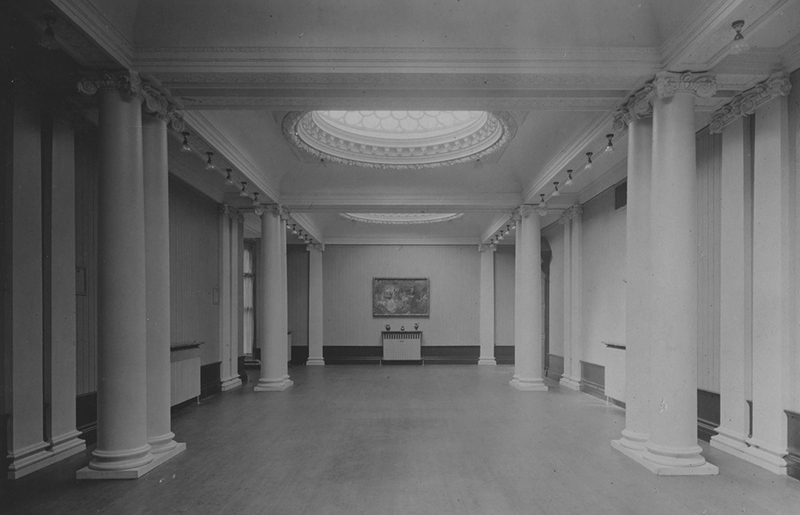 During his brief tenure (1946-48) as Head of Department, Robin Darwin had sought to raise the standard and profile of the the Hatton Gallery’s exhibitions, Gowing took this on wholeheartedly and established an almost continuous programme of modern and historical shows, making the most of Arts Council touring exhibtions, as well as developing a series of in house contemporary art shows that would tour across the country. Within this programme Pasmore and Hamilton particularly were given the freedom to develop and exhibit their own ideas and displays, such as the seminal Man, Machine and Motion and An Exhibit, which were both later shown at the ICA in London. Following a brief interlude when Leonard Evetts was in charge following Gowing’s resignation Kenneth Rowntree was appointed as Professor and Head of Department. Hamilton’s poster for Joe Tilson, like those for the previous year’s Scott Campbell and Japanese Prints, was printed by Kelpra Studio. Coinciding with the start of his tenure as Fellow in Painting in the Fine Art Department, the 47 works Medley selected for the exhibition covered a period of 18 years 1948-65. Staff gather during the final assessment process in the Hatton Gallery, Matt Rugg’s work appears in the background. In 1961 the external examiners were Robert Adams and William Scott. The screenprinted poster for the student 1963 Summer Exhibition was a departure from previous ones in its use of bold, flat areas of colour. Hamilton became increasingly involved in the design of exhibition catalogues and posters, particularly for the annual single artist shows by contemporaries such as Eduardo Paolozzi, Joe Tilson and Sidney Nolan. 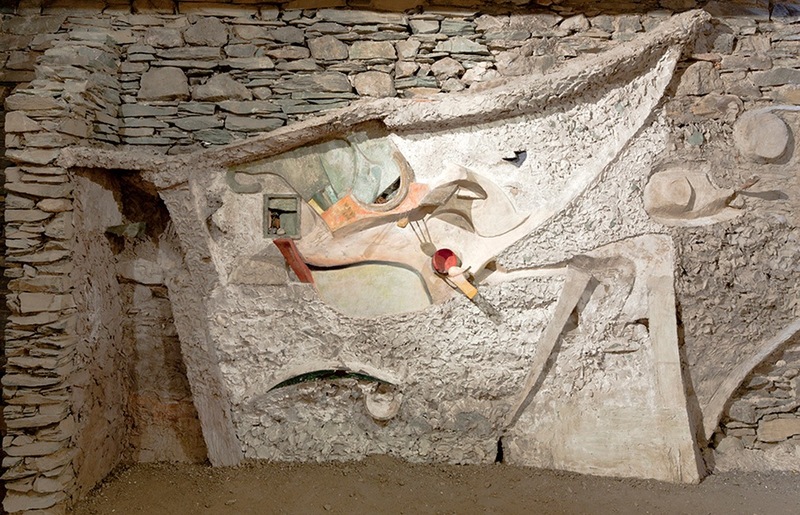 Hamilton was also central in connecting the Department to important European art figures such as Marcel Duchamp (whose ‘Large Glass’ he remade in Newcastle in 1966), Francis Picabia (a retrospective exhibition was held in the Hatton in 1964) and most importantly Kurt Schwitters (whose Merz Barn Wall was acquired by the University in 1965).